Sounds light and refreshing, doesn't it? Now we all know I am not known for health food recipes, or even really, remotely healthy recipes, but occasionally I give it a go. Let's be honest, we are all, wait... MANY of us are trying to live healthier, be lighter, and more active and I am no exception to that idea. I just happen to like to cook really delish stuff that might not be the healthiest choice. That will not change, however, I will be trying to incorporate a few healthier dishes as well. This will be perfect for the summertime. If you have a garden it will be even more awesome. Nothing is more gratifying than strolling out to your backyard crops and picking fresh veggies, that you have planted, nurtured and grown, to feed yourself or your family. I mean, it doesn't get much better than that as far as foodies go! 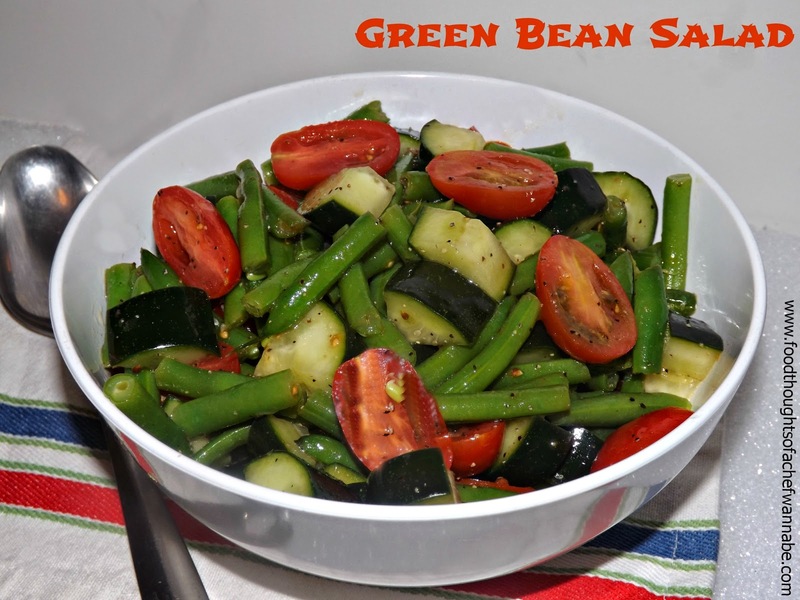 This salad is a great side dish, and I have a feeling it will accompany a few grilled chicken breasts or steaks this summer! It is also perfect for a bbq or picnic, no mayo to worry about! You can certainly add finely minced onion to this recipe, and you could use fresh garlic. Nobody but me in my family enjoys raw garlic, so I opted for garlic salt (2birds 1 stone ya know). Keep that in mind when you are making that choice for the recipe. Here we go! Bring a medium pot full of water to a boil. Add in a generous amount of salt and add your green beans. Let boil for 4 minutes. No longer! Drain them into a colander and immediately toss them into a bowl of cold water and some ice. This is an, "ice bath" and "shocks" the green beans so they stay bright green and immediately stop cooking. You want them crisp tender. (I hate that phrase fyi). While they are being shocked into submission, take care of your tomatoes and cucumbers and put into a large bowl and then, make your dressing! To make the dressing, add all ingredients into a small bowl. Whisk to combine and set aside. Drain green beans again, and then dump into a clean, lint free kitchen towel. Make sure they are all dry and then add them to the large bowl of tomatoes and cucumbers. Pour your dressing over and toss those veggies quite a few times to get them all coated. Now you can serve this immediately but let me assure you, if you make this the night before, or even 2 hours before, and you chill it, they will come! It is one of those dishes, the longer it sits, the better it gets! When you add the green beans to pot, do you wait for water to come to a boil again before timing?